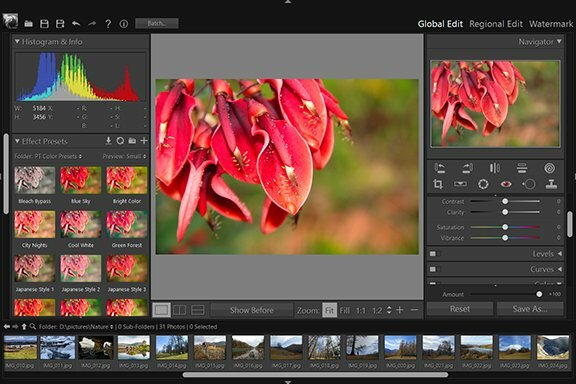 Manage Watermark Presets - User Guide of PT Photo Editor - Easily rescue problem photos. Make every shot its best. Presets provide a way to save a group of watermark and frame settings as templates and apply them to other images by one click. Apply a preset: To apply a watermark preset to the photo, double-click it or right-click it and choose "Apply”. Preview a preset: When you click a preset name, a preview is displayed at the top of the left panel. Filter presets: The symbol in front of the preset name shows what type of watermark preset it is. 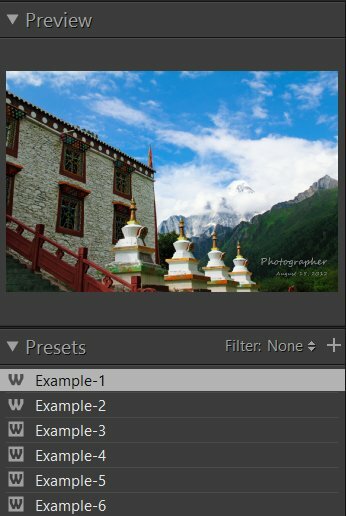 Create a new preset: In the Watermark module, click the button at the top of the Presets panel, then type a name in the Preset Name box and click OK. The preset is added to the list in the Presets panel. Update a preset: Right-click a watermark preset and choose "Update". Rename a preset: To rename a watermark preset, right-click it and choose “Rename”. Delete a preset: To delete one or more watermark presets, select and right-click the presets, choose “Delete”. To import presets, right-click on the presets panel and choose "Import...", then select the preset files and click "Open". To export presets, right-click the selected presets and choose "Export...". Specify a file folder and click "OK". Restore default presets: Right-click on the presets panel and choose "Restore default presets".